South on Main brings Big Piph & Tomorrow Maybe back to their stage tonight! Doors open at 4:00 PM, show begins at 10:00 PM. Wristbands can be purchased for $15 after doors open. Call (501) 244-9660 to reserve your table for this show in advance. “One of Arkansas’ best bands” and “hip-hop ensemble” are terms often used for the collective known as Big Piph & Tomorrow Maybe. However, although they are both deserving titles, they have proven to be too confining of descriptions. The creativity, work, and showmanship that BPTM put into their jazz, soul, funk, and rock infused hip-hop experiences will soon have them recognized as one of the best bands.. period. Although he was already enjoying a successful solo rap career, Epiphany looked to further separate himself from the pack of competitive emcees by joining forces with a stellar live band, and in 2012 he did just that. Each of the seven members approaches the apex of their field and is a “frontman” in their own right. 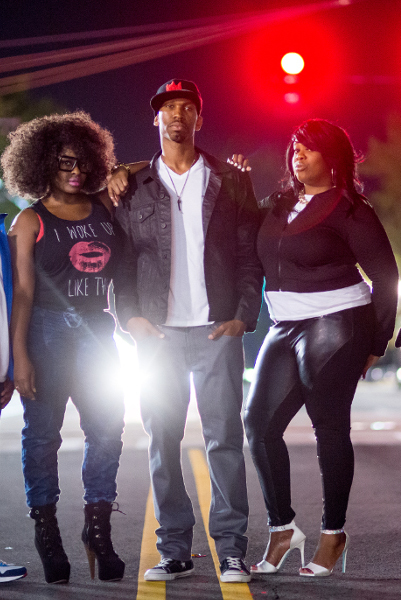 However, when their paths finally overlapped, the collective of Paul Campbell (percussion), Dre Franklin (keys), Bijoux Pighee (vocals), Epiphany “Big Piph” Morrow (MC/lead vocalist), Dee Dee Jones (vocals), “Cool Hand” Lucas Murray (guitar), and Corey Harris (bass) formed something special. Bijoux is a sultry, soul singer adept in various styles. The daughter of West African parents, she grew up in a household exposed to differing genres of music including folk, classic rock and roll, makosa, country, and R&B. As a child she grew up singing in talent shows she produced, as well as church and school choirs. After years of high school and collegiate choral experience (madrigals, sacred African-American chamber, etc. ), she discovered a love for jazz . In 2009, she emerged onto the scene again as a featured artist with groups like Rodney Block & The Real Music Lovers and Onyx The Band. 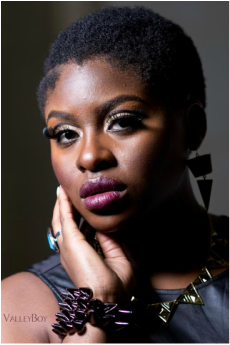 Bijoux has opened for and sung with the likes of Kim Burrell, Anthony Hamilton, Dwele, Maurette Brown Clark, Sunday Best Season One Winner Crystal Aiken, Sunday Best Season Two Winner Y’Anna Crawley, DeWayne Woods, and Beverly Crawford. I have been featured on several local projects for Rodney Block, Epiphany, Kwestion, and more. She frequently performs at various Little Rock music venues. Legends of Arkansas, the all-day, family-friendly live music and art festival, is Saturday, September 19, 2015. This is the third annual all-Arkansas, grassroots event to be held at Riverfront Park in downtown Little Rock, Arkansas. We will celebrate some of the best artists and musicians in Arkansas, as well as independent businesses from around the state with free admission to the public. The music starts at 12:00 p.m. and continues until 11:00 p.m. with more than twenty live bands on two stages; the History Pavilion and First Security Amphitheater. Artists include Adam Faucett & the Tall Grass, The Wild Flowers, Barrett Baber, Good Foot, Whole Fam Damily, Ducktronaut, Collin vs. Adam, Big Piph, Stephan James, Makenzie Jordan, Franko Coleman, Fisher DeClerk, Sarah Cecil, Chris Long Acoustic, Brian Nahlen, Chris DeClerk Solo, Charlotte Taylor w/ Matt Stone, Mothwind, Federalis, Sick Numbles, Groovecluster, S!Bass Cadet, and DJ DripFunk. The Master of Ceremonies will be Mr. Mike Poe with special guest appearances from Shoog Radio’s own Aaron Sarlo and Kara Bibb from KABF. On the main stage, in between the music, there will be performing artists, pitch competition finals, a hip-hop workshop and award presentations. ReCreation Studios will perform live art around the park throughout the day with stilt-walkers, hula hoop dancers, aerial silk performances on the main stage, and a special fire performance after headlining act, Adam Faucett. Paul Prater will amaze once again with his fringe style performing art. There will also be different artist demonstrating their art throughout the park. The walkways around the amphitheater will be lined with local art and craft vendors, including some Etsy Little Rock vendors. Small businesses, including some of the finest local food trucks, will be set up around the festival to promote and showcase their businesses, as well as nonprofits, to educate on their causes. Legends of Arkansas, local businesses, and nonprofits hope to show the public how easy it can be to spend and keep our money in our own community. 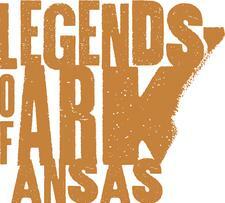 Legends of Arkansas is family-friendly and admission is free. Tonight at 10pm, join the Oxford American magazine for a special release event for the new Big Piph & Tomorrow Maybe project: Cell Therapy! Tickets are $10 each, cash only at the door. Come celebrate Big Piph’s last Arkansas show before embarking on AMA Overseas Tour for several months. Big Piph & Tomorrow Maybe is a fusion of funk, soul, and rock mixed nicely over a hip-hop foundation. Six musicians and vocalists with their own bands and followings combined with lead emcee, Big Piph, to form a creation all of their own. Come jam with them one last time before they leave the country for a month long tour in Africa. Their latest project, Cell Therapy: The Unplugged, Unauthorized Session of Big Piph & Tomorrow Maybe will also be newly available for purchase. Performing as Big Piph & Tomorrow Maybe: Big Piph (lead vocalist), Bijoux (vocalist), Dee Dee Jones (vocalist), Corey Harris (bass), Lucas “Cool Hand” Murray (lead guitar), Dre Franklin (keys), and Paul Campbell (percussion). Big Piph, an emcee formerly known as “Epiphany,” and Tomorrow Maybe, a full band including female vocalists, will perform an innovative hip hop concert at the CALS Ron Robinson Theater on Friday, November 21, at 7:00 p.m. Tickets are $15, general admission, and available online or at Butler Center Galleries, 401 President Clinton Ave.
Big Piph has performed with artists such as T.I., Snoop Dogg, Ludacris, and Ne-Yo. Lindsey Millar of the Arkansas Times has described Big Piph’s style as “existential hip-hop that you’d want to party to.” Big Piph & Tomorrow Maybe play a unique fusion of funk, soul, and rock with a hip-hop foundation. They are currently crafting an “unplugged” EP, and Big Piph is heading up a fundraiser for Global Kids Arkansas to offer educational and hands-on experiences in foreign policy and global initiative to high school students in at-risk communities. The concert is the latest in the Arkansas Sounds music series. Arkansas Sounds is a project of the Butler Center for Arkansas Studies, a department of the Central Arkansas Library System. Focused on Arkansas music and musicians both past and present, Arkansas Sounds presents concerts, workshops, and other events to showcase Arkansas’s musical culture.